More than any other violin maker of the 18th century, Giovanni Battista Guadagnini led an itinerant career. Over a span of nearly 50 years his labels place him in Piacenza, Milan, Cremona, Parma and finally Turin. During each of these periods his work has a unique and distinct style and the progression from one city to the next tells a colorful tale of one of the most talented and most prolific makers of the 18th century. The city of Milan was by far the largest and most cosmopolitan of the cities in which Guadagnini worked. Since the mid 17th century there had been an active community of violin makers led first by the Grancino family and later by the Testores, Lavazzas and others. By the time Guadagnini arrived in Milan in the autumn of 1749, however, the Milanese violin making tradition appears to have entered a precipitous decline. The Grancino workshop was no longer active; the two Testore brothers Carlo Antonio and Paolo Antonio were making mostly commercial instruments, often from cheaper materials and without purfling and linings; Ferdinando Alberti appears to have ceased making instruments altogether; and Giovanni Francesco Leonporri had recently left for Rome and l’Aquila. The only work of some quality that was being done in Milan was by Carlo Ferdinando Landolfi, who had arrived from Baveno in Piedmont at around the same time as Guadagnini. In comparison to Milanese instruments from the years preceding 1749, Guadagnini’s work was very different: his model was wider, his wood selection finer and his varnish more colorful and lustrous. It’s notable that Guadagnini’s instruments during this period were highly individual and neither conformed to the local Milanese standards nor adapted to the Cremonese paradigm. Details now essential to the character of Guadagnini’s work, like the distinctive shape and placement of soundholes, must have seemed unusual and yet highly alluring to the local Milanese. Over a hundred violins and about half a dozen cellos are attributed to Guadagnini’s Milan period. It’s likely that Guadagnini enjoyed patronage from local musical circles, thanks in part to the endorsement of the brothers Carlo and Paolo Ferrari, his patrons from Piacenza who were now highly influential in the Milanese musical establishment. But even with the backing of prominent musicians, his apparent success as a new arrival in a large city must in large part be attributed to the quality and freshness of his making. The ‘Berkova’ is a typical example of Guadagnini’s fine Milanese work. Its broad model, low arch and flat edges and corners are perfect for a powerful tone. The wood for the back, ribs and head is of attractive imported maple and the top is of fine, even-grained spruce. The elegant and characteristic styling of the wide-set soundholes with almond-shaped lower lobes is typical of this period and the plentiful evidence of scribelines and compass points shows a brisk, purposeful and unfussy working style. The varnish of the ‘Berkova’ is a beautiful and deep, yet transparent, reddish-brown and survives largely undisturbed on this well-preserved violin. From Luigi Tarisio to Gerald Segelman, the history of violin collecting has included a number of colorful rags-to-riches personalities whose eye for fine violins has been matched by their phenomenal collecting obsessions. The first known owner of the ‘Berkova’ Guadagnini, Joseph Gillott, was the son of a knife-maker who had made his fortune by mass producing steel pen nibs in Birmingham in the early 19th century. From the start, Gillott’s behavior marked him as a man of singular peculiarity. Fearing that his rivals would get wind of the success of his business, he refused to open a bank account, keeping his profits in pickle jars sown into old socks and stuffed into his mattress. As his business expanded in the 1830s, his attentions turned first to art, famously purchasing the entire contents of J. M. W. Turner’s studio on one visit to London. Following an exchange with the poet Edwin Atherstone in 1848, he began collecting old violins, despite a complete lack of musical knowledge or skills. Gillott bought old violins wherever and however he could often through trades rather than by exchanging cash. In 1849 he swapped sixty paintings to acquire nine violins from the London dealer John Hart, and at other times he used diamonds and other precious stones to seal a deal. When Gillott died in 1872, George Hart, the son of John, was sent to Birmingham to catalogue Gillott’s collection of violins. Throughout Gillott’s pen-making factory he found room after room piled high with instruments of all types. 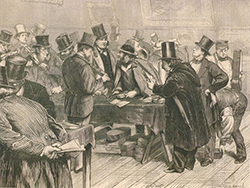 Of his collection, 140 lots were brought to London where they formed arguably the most important auction of the 19th century, lasting four days and earning a total of £4,195. The enormous scale of the Gillot auction is thought to have led to a temporary slump in instrument prices, as the market was flooded with an overabundance of fine quality violins all coming up for sale all at the same time. As a consequence many of the instruments from the Gillott collection were not resold until many years after the auction had passed. The ‘Berkova’ Guadagnini, bought at the sale by George Hart wasn’t seen again for nearly 20 years. 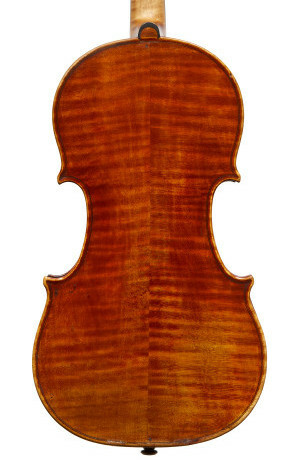 In 1889 Hart sold the violin to Albert Mitchell in a transaction that involved the exchange of “a Nicholas Lupot (large model), a fine Grancino, and a sum of money, I have forgotten how much”, the records providing a small glimpse of the esteem that the market already held for Guadagnini’s work by the end of the 19th century. 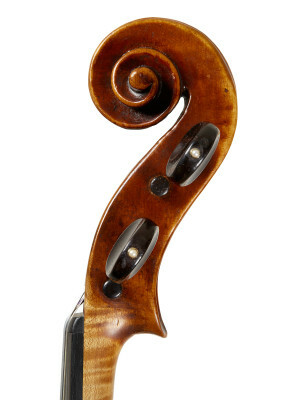 Eventually the ‘Berkova’ reached America where in 1919 it was sold by the Boston violin maker, Walter S. Goss, to the collector–dealer Nathan Posner of The Bronx. Posner later sold the violin to Hilda Berkowitz for the use of her daughter Frances, a child-prodigy in Los Angeles. Born in 1906, Frances Berkowitz would later change her name to Frances Berkova, following a fashion for Russian names amongst rising musical stars. She studied with Leopold Auer and Carl Flesch, before embarking – Guadagnini in hand – on concert tours of Europe and America in which she established her reputation as a soloist. After her New York debut on November 24, 1926 she was praised by the Herald Tribune as “the most promising violinist of a decade”. After a concert in California in 1928, Berkova had a chance encounter with a young fan that would have a special significance nearly half a century later. 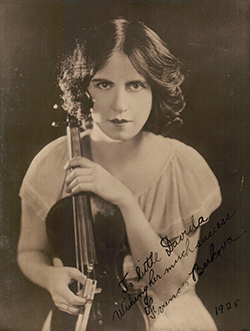 After playing the Conus Concerto with the Philharmonic Orchestra of Los Angeles, Berkova signed a photograph for a 13-year-old girl named Davida Jackson: “To little Davida, wishing her much success.” Nearly half a century later, in 1972, this same Davida Jackson bought Berkova’s 1755 Guadagnini violin. It was sold by her heirs in 2013.